Even though I'm a planner at heart, my favorite part about traveling and visiting new places is those unexpected discoveries that leave you smiling for days. 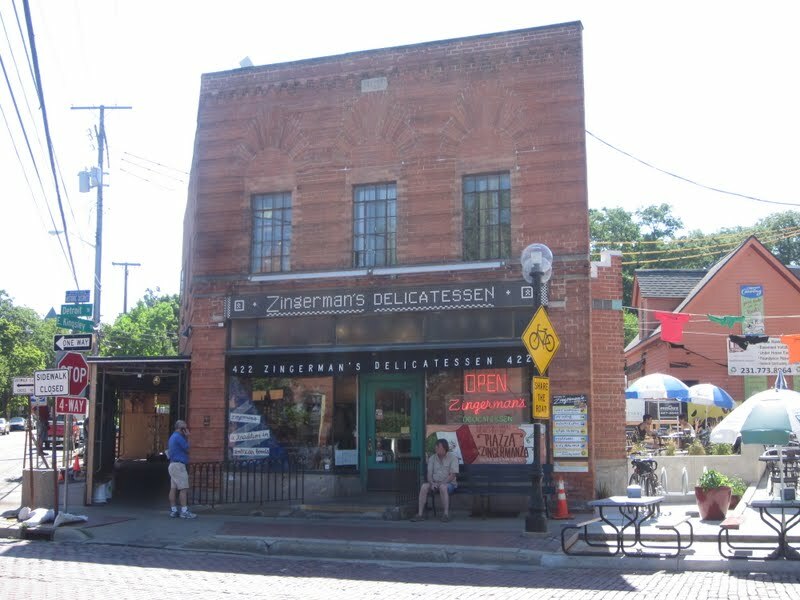 I had one such experience at Zingerman's Deli in Ann Arbor, Michigan. If you're familiar with Zingerman's, you're probably assuming I fell head over heals for their famous corned beef sandwiches. Or maybe it was the deli cases that sucked me in. Or the hip, kitschy atmosphere. Truthfully, that was all wonderful. I passed on the corned beef and ordered a personal favorite: a chicken salad sandwich. It was awesome. Creamy, but not too much mayo. Lots of tender pieces of chicken and crisp celery. Perfectly seasoned. But it's not what brought a smile to my face. I got to sit outside with a magazine on the sunny patio and read for pleasure for more than an hour. Which also left me very happy and content. But what will I remember most about Zingerman's? The birch beer soda. And if it's one thing you could count on my grandparents to have stocked up, it was birch beer. Tons and tons of this clear, delicious root beer-type of drink. I think my sister and I guzzled it down by the gallon whenever we visited. Given the number of grandchildren they had (and the language barrier--they only spoke French), my grandparents couldn't always show the type of individual attention or gift-giving that some grandparents shower upon their grandkids. But always having birch beer for us kids and a big, strong hug to greet us? We never doubted how much they loved us. But between moving to Indiana (where I've never seen it in a store or on a menu), and my grandparents' subsequent passing, I haven't had a drop of birch beer since I was 10 years old. When I approached the soda dispenser at Zingerman's, I was startled to see that my typical choice of a Diet Coke wasn't there. 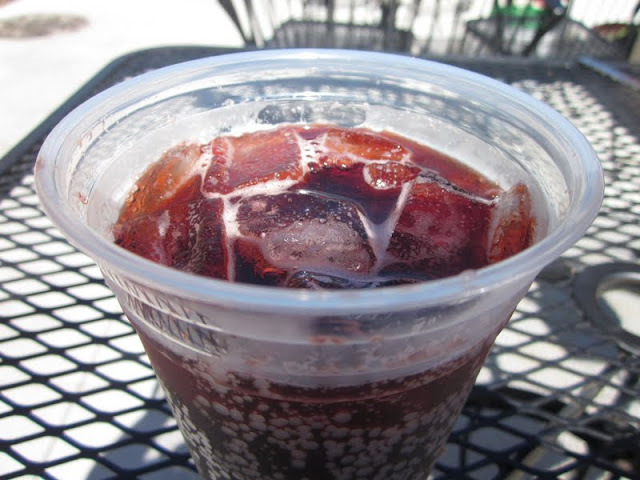 Instead, Zingerman's serves Boylan's Fountain Soda, a specialty line of bubbly beverages. I quickly glanced at my options and when I saw "Creamy Red Birch Beer" was a choice, I think I almost fainted. While it wasn't the same clear color I remember from my childhood, the red version tasted just the same. I think I sucked down three glasses before taking a final refill to go. What's that people say about drinking alone? 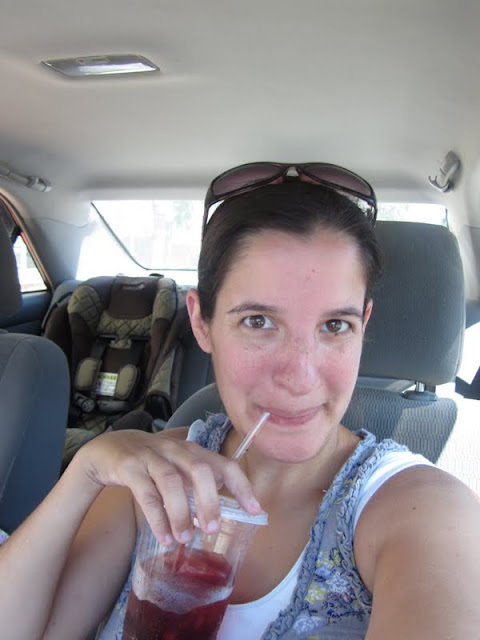 I was far too embarassed to photograph myself drinking soda in front of all the other diners on the patio. So this was taken in the privacy of my car. Zingerman's, I don't know if anyone has ever thanked you for offering birch beer. If not, let me be the first. It's been well over a decade since I saw my grandparents, but I sure felt them that day at lunch. You can read more about my kid-free day in Ann Arbor here. 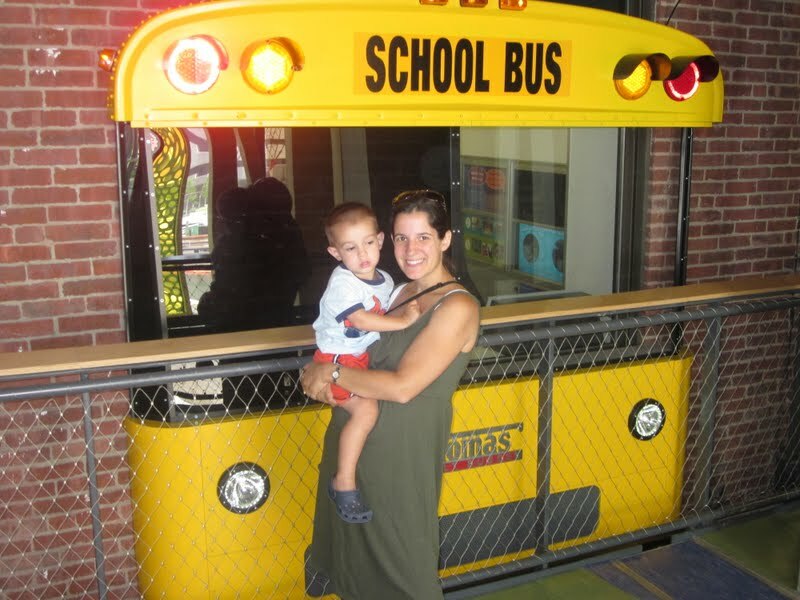 A few weeks ago, my sister called me out of the blue and invited me to join her in Ann Arbor, Michigan for a kid-free overnight (scheduled for the very next day). I'm sure she thought I'd say no, afterall, she's the spontaneous one in the family and this trip required jumping in the car without much thought. Not really my style. But I hung up the phone and thought, if not now, then when? Baby Arrow's arrival is quickly approaching, and impromptu road trips will become a thing of the past (temporarily, I hope!) My sister and I both have young kids, so the time we spend together is typically consumed by wiping noses, fixing lunches, and desperately trying to get all the kids to nap at the same time (which we are rarely successful at doing). So 24 hours without those obligations and lots of time to chat in the car sounded really good. Off we went... she was there for a conference, leaving me with several hours in beautiful Ann Arbor to roam and explore on my own. Heaven. I spent the first couple of hours at Sweetwaters Cafe, a coffee shop in the Kerrytown Market to finish up some writing deadlines that were breathing down my neck. While it sounds a bit boring, any stay-at-home mom will tell you that a couple of hours in a coffee shop is just about the best present you could give her. From there, I was off to explore the shops themselves. A little too upscale for my taste, but it was fun to browse without worrying about little hands breaking valuables. By now I was hungry for lunch, so I headed to an Ann Arbor institution--Zingerman's. The deli location of this restaurant/mail order business was just a few blocks away from Kerrytown. 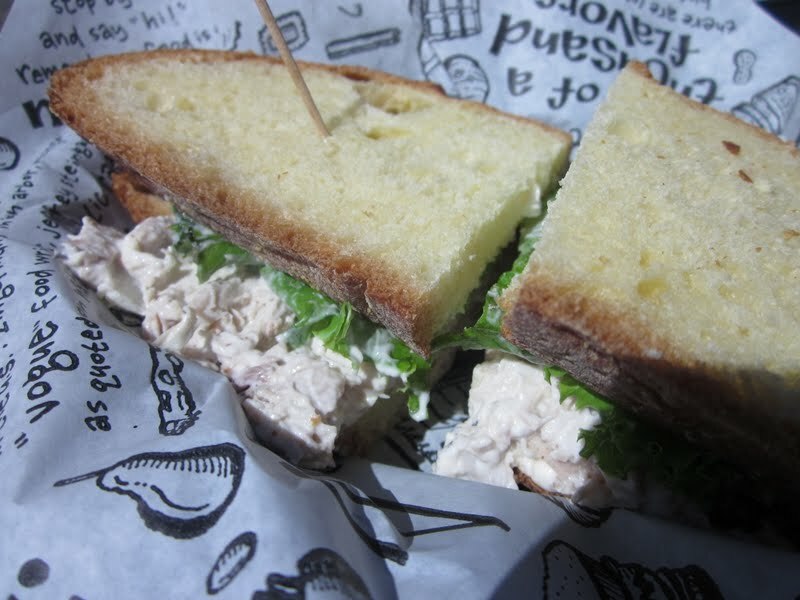 Read more on my lunch at Zingerman's Deli here. Finally, I thought I'd better get myself to the University of Michigan's campus, the lifeblood of Ann Arbor. I've toured campus before: after my husband was accepted to U of M's business school for his MBA, we gave serious consideration to moving to Ann Arbor. But this time, I got to enjoy it from a tourist perspective. 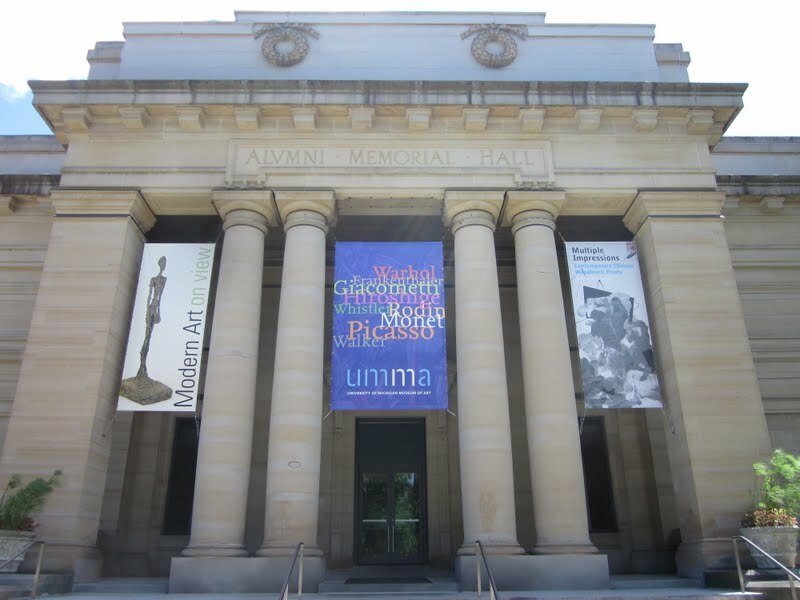 If you're interested in more details about UMMA, I look to Dominique at Midwest Guest for all things Michigan, and she doesn't disappoint with her knowledge of UMMA. Days like these are few and far between for me. That's fine--I love having The Arrow as my nearly constant companion. But their rarity makes them all the more special and appreciated. And I love rediscovering who I am as a traveler and adventurer when I'm me, and not just Mom. When I learned I had won the HomeAway Blog Away contest and we would be heading to Boston for the 4th of July, the trip was already less than two months away. Needless to say, many of the HomeAway properties in the city were already booked for that time period. I soon narrowed our search down to ArtHouse in Jamaica Plain. 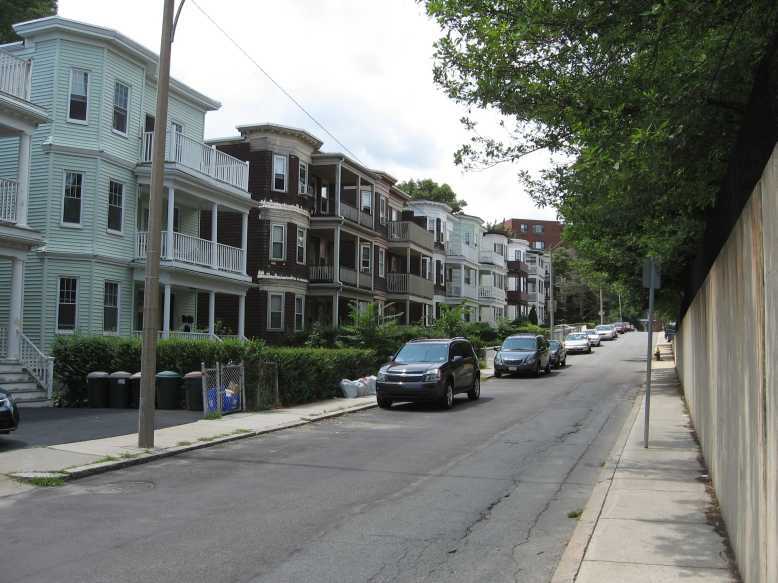 I knew nothing about Jamaica Plain, but the house itself met our needs perfectly, so I took a chance and booked it. The minute we arrived in Jamaica Plain I knew it was a perfect fit. It reminded us so much of our old neighborhood in downtown Indianapolis--lots of one and two family homes just a few inches apart from each other. It also had a diverse mix of people that we love. Plus, we were just steps away from the Stony Brook T station, meaning we could be in downtown Boston in about 10-15 minutes. While my initial preference was to stay in the heart of the city, it was actually nice to escape it throughout the day, give The Arrow a little more room to play, and just relax a bit more than we might have otherwise. 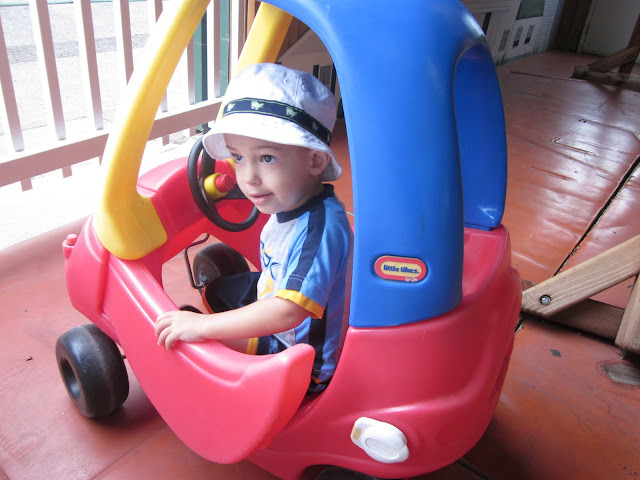 We didn't rent a car, and we certainly didn't need one while staying in Jamaica Plain. We were just a few blocks from several grocery stores, restaurants, and other life necessities. 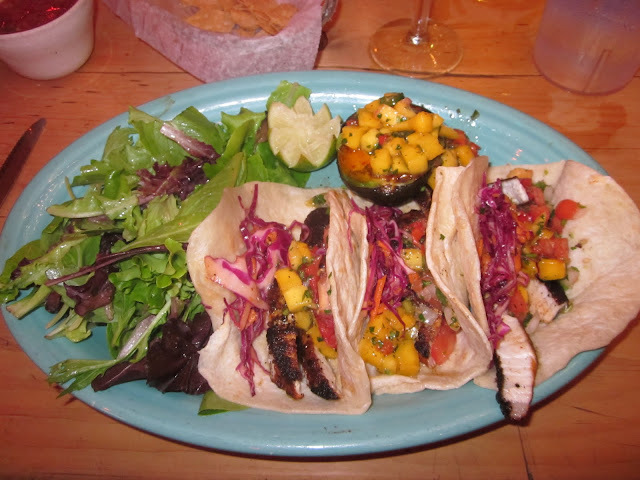 Our favorite restaurant in Jamaica Plain was Bella Luna, which I'm sure I'll be writing about soon. 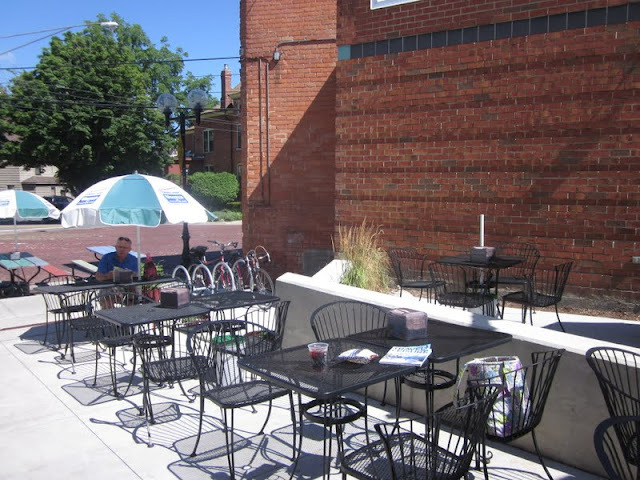 Great spot for gourmet pizza, with a beautiful outdoor patio. We soon learned that Jamaica Plain is a destination in and of itself. The Sam Adams Brewery was just around the corner from ArtHouse. We tried to take the tour, but the last tour of the day on our last day of the trip was already sold out when we arrived (so book in advance or arrive early if it's on your list of things to see). There's also Jamaica Pond, which is another attraction we didn't get around to visiting. 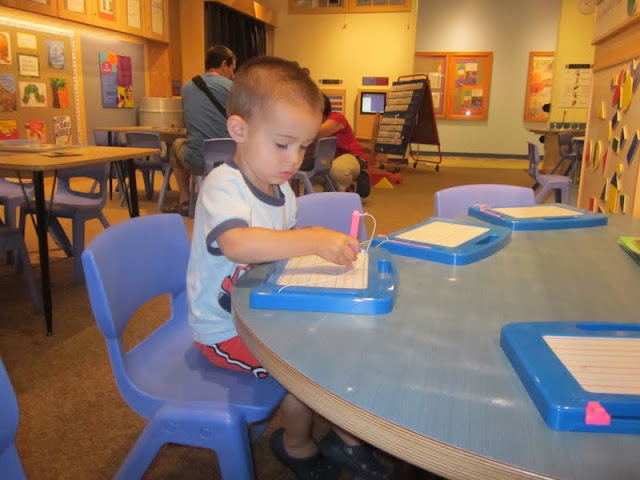 The Franklin Park Zoo and Arnold Arboretum are both just short T rides (or long walks) away. In fact, if we would have had another day in Boston, I think we would have just spent it exploring this vibrant area. 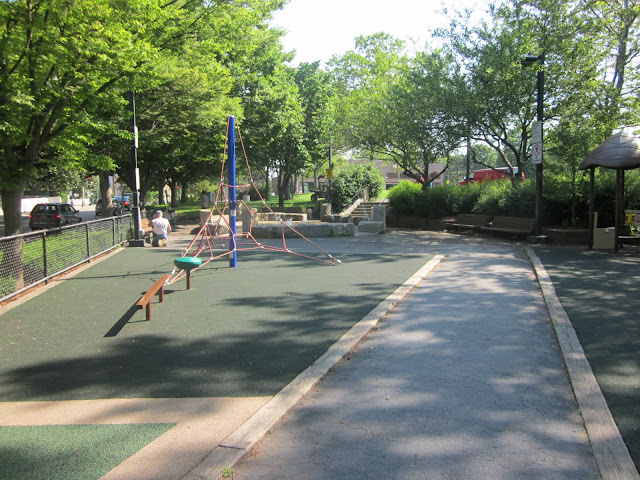 As it turns out, our favorite feature of Jamaica Plain was Southwest Corridor Park. It basically stretches from Back Bay to Forest Hills along the orange T line. 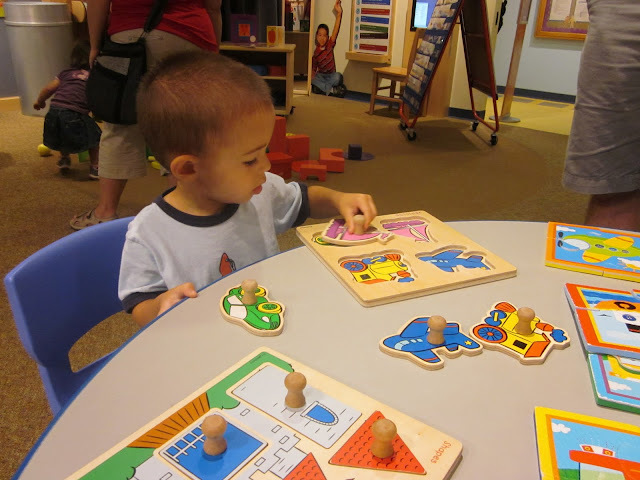 A portion of the park was directly across the street from ArtHouse, making it incredibly convenient for our family. This section of the park featured a large, grassy space crying out for a picnic, a basketball court, a large playground and a small splash pad for cooling off. Needless to say, The Arrow insisted we make a lot of stops here as we walked to and from the T.
The HomeAway rental property that we selected is called ArtHouse. It was a great two-bedroom, one-bath two-family home. We rented the first floor, while the owners live on the 2nd floor. This meant they were accessible and helpful to us if we needed anything, but yet we all had our own space and privacy. It was decorated very nicely, was very bright and cheery, and overall, just a really comfortable and clean place to relax and rest our heads at night. 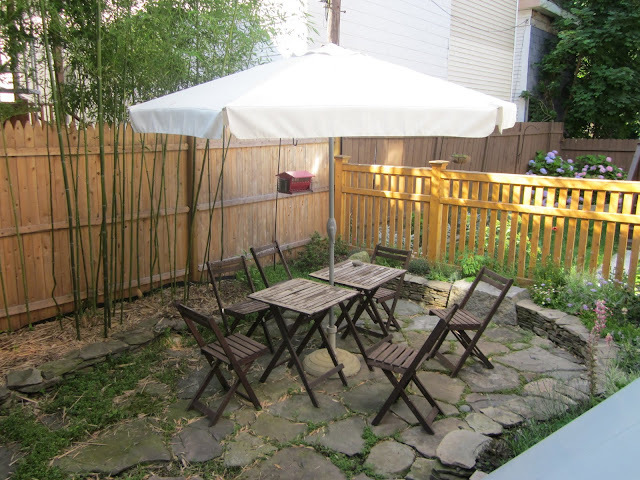 Perhaps our favorite feature, although we didn't use it as much as we would have liked, was the backyard patio area. Very shady and serene, a perfect place to crack open a beer or have a glass of wine after a day of sightseeing. ArtHouse was ideal for staying in Boston with a toddler. The owners also have a young child, and we were greeted with several baskets of toys and books to entertain The Arrow during our stay. 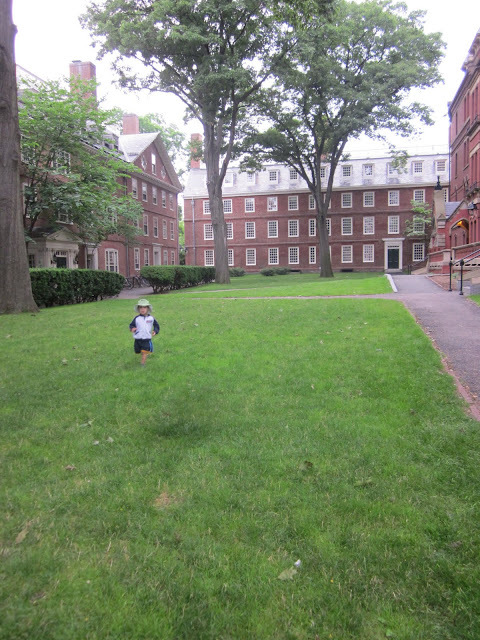 The small yard meant we had some extra space, and the proximity to the park just can't be beat. There are many, many reasons I prefer rental properties over hotels when traveling, and ArtHouse was no exception. One of the requirements of winning the HomeAway contest was that we would spend a portion of the prize money on a HomeAway rental property. HomeAway covered all of the expenses associated with renting ArtHouse. I was not required to write about our experience staying there, and all opinions are my own. If I were traveling to Boston on my own dime, I would definitely consider renting this property. For more information on our time in Boston, read my Boston Trip Report. I've been feeling a bit melancholy about posting lately. In fact, this time last week I couldn't even muster the energy to hit publish on a post I had already written about our upcoming weekend plans. 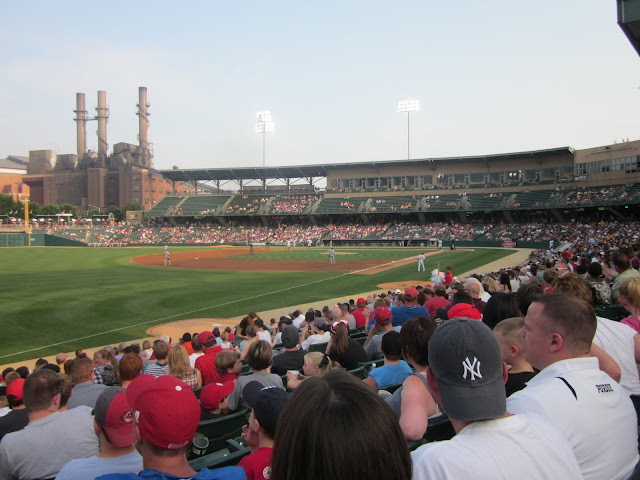 Nearly all my writing, both here and at Visit Indiana, involves encouraging people to get out and do fun things. So it's particularly hard to get in the right frame of mind to write when the images splashing across the news and in the paper involve crumbling stages and a growing list of fatalities at those very attractions I've written about. 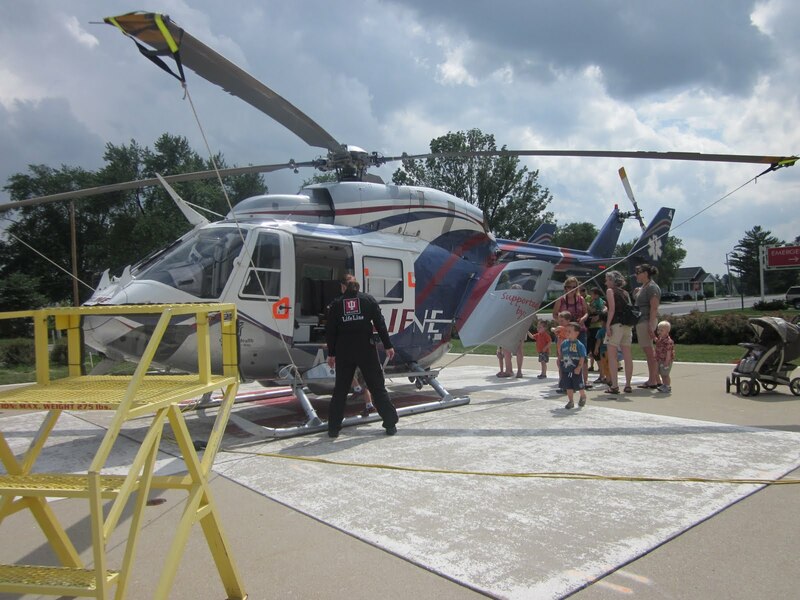 Those killed and injured at the Indiana State Fair last weekend had plans for a lovely evening, enjoying live music and taking in all the wonderful aspects of a night at the Fairgrounds. Exactly the type of thing I focus on. That night, as the weather turned ugly an hour north of my house, I, too, was listening to live music at a nearby park. No big stage infrastructure, it was just a local band playing on our town park's little stage. It all seemed so ideal and picturesque for our family: we could supervise The Arrow on the playground while my husband and I relaxed on a blanket. We even said to each other that summer nights don't get more perfect than this. After we tucked The Arrow into bed that evening, we heard the awful news about the stage collapse at the Indiana State Fair. Fortunately, everyone I knew at the concert had either already left by the time of the collapse or were seated out of harm's way. Too many others weren't so blessed. My heart hurts for my fellow Hoosiers. This tragedy, at a venue I've attended many a concert, in a city I often go to for fun, at an annual event I've done my part to encourage people to visit, struck too close. And yet I look at that picture above and think, isn't this what life is all about? 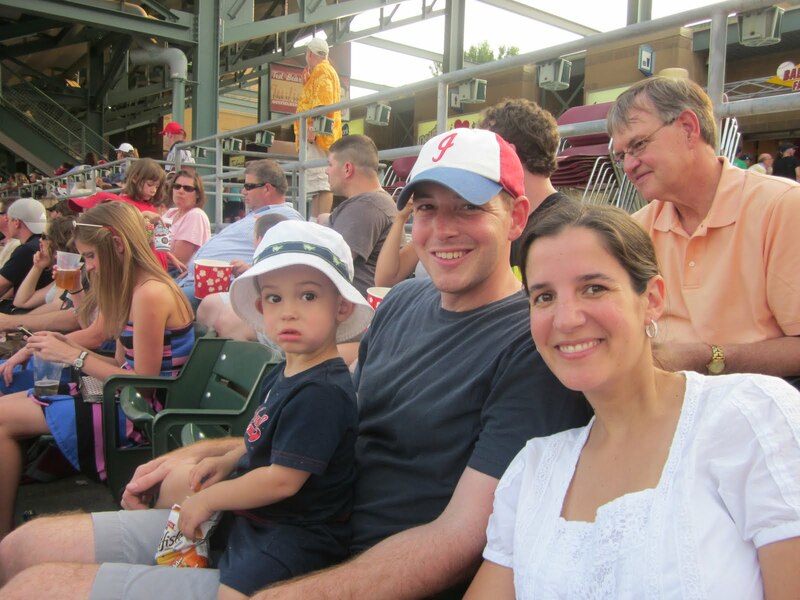 Getting out and enjoying our families, our friends, the places we call home? Kiss your kids every chance you get. Take them to interesting places. Expose them to all the world has to offer. The world is a scary place. Staying home doesn't make it any less so. While I'm unbelievably saddened by what happened last weekend, I continue to hold these truths close to my heart. And I'll continue to write about them. 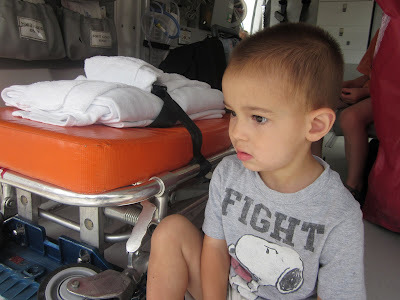 Reflecting on the Indiana State Fair Tragedy at Just Like the Number. This post is a part of Mondays are for Dreaming at The Mother of All Trips. I'm dreaming of better days ahead for Indiana. 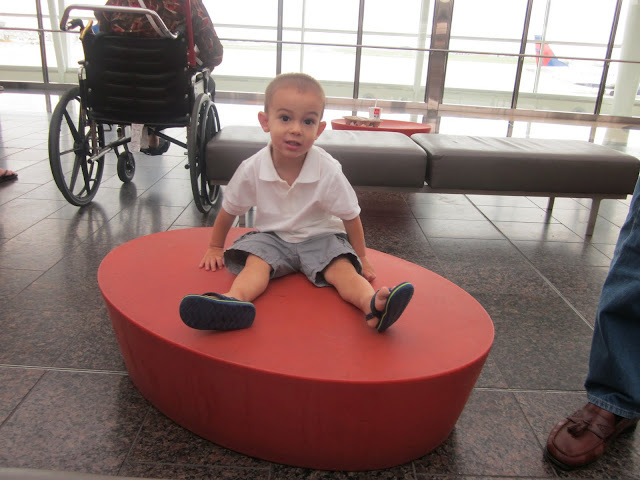 My husband travels pretty regularly for work, and his international trips almost always begin with a Sunday afternoon departure out of the Indianapolis International Airport. So it's become a bit of a tradition to drive up, have lunch together in the sprawling atrium, and then bid him farewell for the week. I can't say enough about how great it is to have a brand new airport terminal as your traveling homebase (even when you're not the one traveling!). The arrow loves the spaciousness of the airport's Civic Plaza. He wanders from pod seat to pod seat, crawling on top and pretending to be quite the king once he's mounted on his perch. The ceiling must be at least 3 stories above us, the windows stretch just as high, and there is ample room for everyone to feel as though their personal space isn't being invaded. There's a pretty good view of the planes pulling up to their gate, as well as phenomenal public art. And the food is great, too. When designing the new terminal, it was determined that several food vendor slots would be dedicated to local, independent restaurants. So there's some unique local cuisine to sample while you wait for your flight. Our favorites are Cafe Patachou and Giorgio's Pizza (which you can access without a ticket since they are located in Civic Plaza), and Harry & Izzys, Shapiro's and King David Dogs in the Concourse areas (ticket required). No one likes to be stuck in an airport, and it is certainly sad to say goodbye to dad for the week. But The Arrow and I like to make the best of things, so we've come to take comfort in our Sunday "travel" tradition! 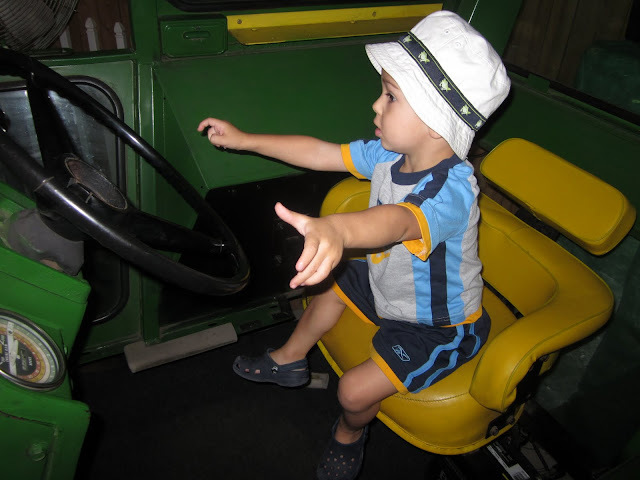 The Arrow absolutely loved the Little Hands on the Farm exhibit. 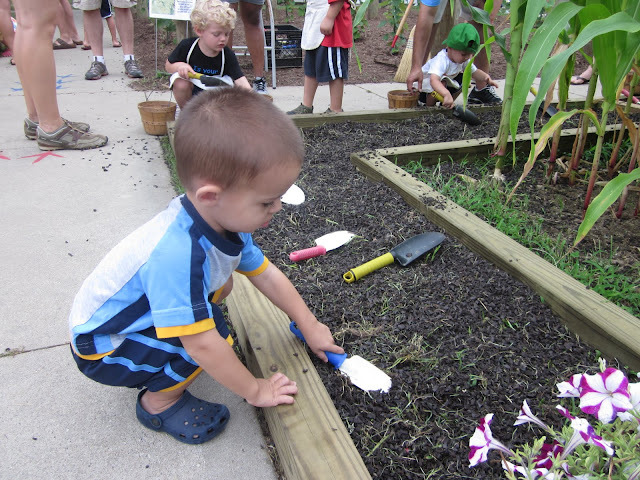 It's a chance for young kids to experience life on the farm, with age-appropriate activities (like feeding the pigs, planting seeds and driving a tractor). They even earn a dollar for all their hard work, which they can use to buy treats (like a juice box) at the market. While the Little Hands on the Farm exhibit was a planned stop, ducking into the Indiana Young Farmers Assocation building definitely wasn't. And yet we nearly had to drag The Arrow away... he loved the playground, the magnetic fishing pond, the tractor he could sit on and pretend to drive. That's such a great aspect of the Indiana State Fair... you never know what you might find that will hold your attention! Just a little sampling of our day at the Indiana State Fair! The Fair runs through August 17, so there's still plenty of time to visit. 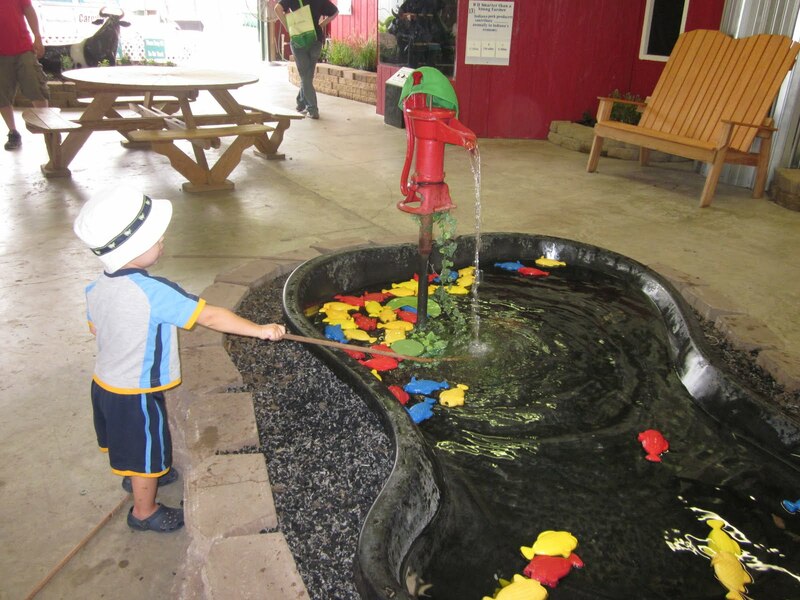 You'll find the Little Hands on the Farm exhibit in the Riley Fun Park on the northeast side of the Fairgrounds. It opens at 9 a.m. The Indiana Young Farmers Association building is just east of the Indiana DNR building (another good stop! ), also on the northside of the Fairgrounds. Both are free with admission to the Fair. This weekend, I visited the Indiana State Fair and the arrow tagged along. Attending a big, crowded, often miserably hot event like this can be especially tricky if you're toting along a baby or toddler (or both! ), but I'm happy to report there is still lots of fun to be had. Many of my tips below are applicable to any large summer festival or fair, so even if the Indiana State Fair isn't in your plans, you might still find these tips helpful. 1.) Seek out lactation/feeding areas. This was the main reason I didn't bring the arrow to the fair when he was a 4-month old. We were still deep in the "eating every 2 1/2-hour phase," and I couldn't help but picture myself trying to discreetly nurse him in the corner of a hot, smelly, dirty swine barn. No thanks. I should have done some more research: the Indiana State Fair offers two lactation/nursing/feeding stations. You'll find these private, shady tents near the Riley Fun Park and Dow AgroSciences Celebration Park. 2.) Head to an exhibit pavilion. If you're nowhere near the above mentioned lactation stations when baby needs to eat, find the closest air-conditioned pavilion. 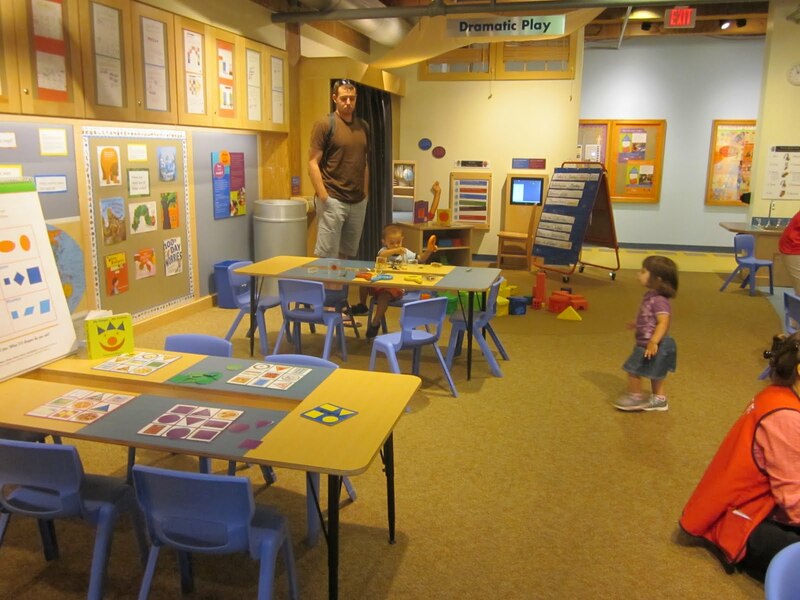 Often the buildings that exhibit crafts, canned goods and other household products are quiet, clean and relaxing spaces. This is also a good plan if you and your kids just need to cool off for a few minutes, change a diaper, etc. We took refuge in the Ball State/Ag Hort building just off the Midway on Sunday for a little while. It was just us and a few old people checking out the enormous pumpkins. We were all approaching meltdown territory when we entered, and after a few minutes, we left in much better spirits. 3.) Review your map in advance. Long gone are the days my husband and I aimlessly wandered the enormous fairgrounds. Instead, I tried to get a general sense of what was where the evening before we headed out to the fair. I knew of a few activities I wanted to do and see, so I got a sense of what was near each other, where we should start our day, etc. Then I referred to the map a few times as we walked around that morning. 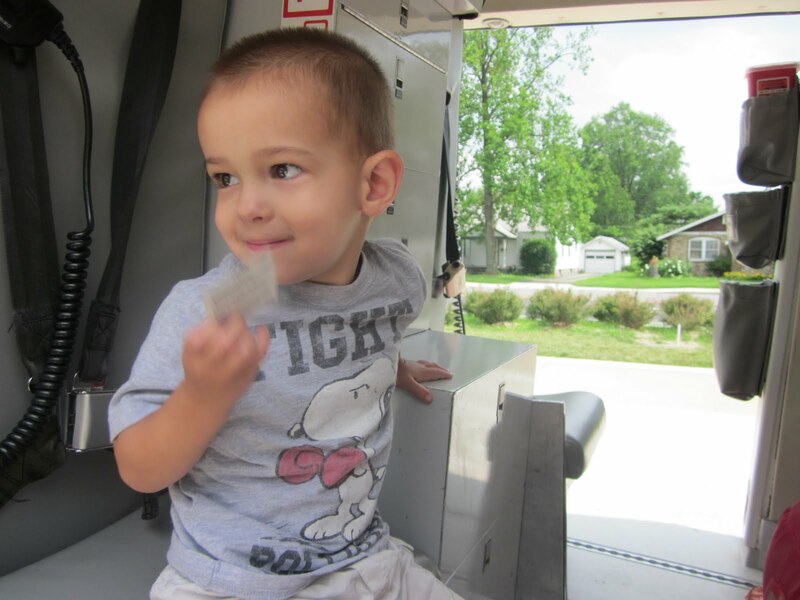 A little planning goes a long way when taking babies and toddlers to the fair. If you have a Droid or iPhone, the Indiana State Fair now offers an interactive map with their app. The livestock barns. 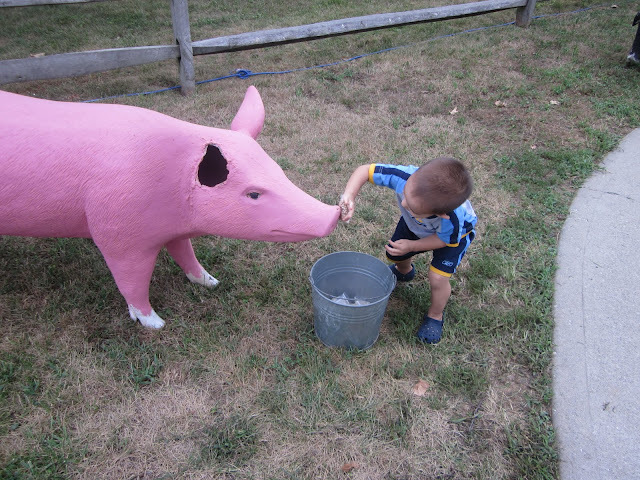 The barns can get hot and smelly, but I love the opportunity for kids to interact with these farm animals. I've heard the barn where the racing horses stay is particularly good. I'll write more about some of these on Friday, but this is by no means an exhaustive list. There is so much for young kids to see and do at the Indiana State Fair! 5.) 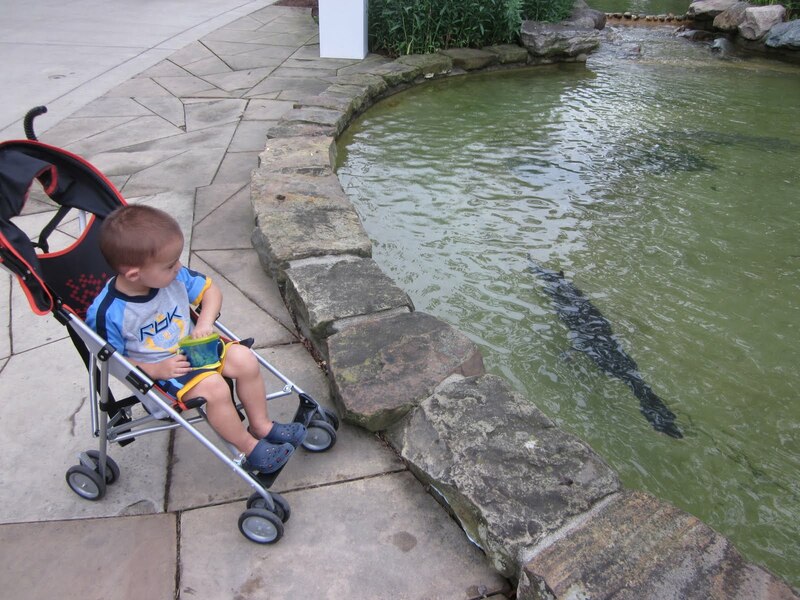 Bring a good stroller. I used our cheap-as-can-be umbrella stroller and it was clearly the wrong choice. The infield parking area has fairly long grass, and there are many areas I navigated that were really bumpy or unpaved. I should have brought our jogging stroller instead. It also has more under-the-seat storage which would have been helpful to us. Rookie mistake. 6.) Find the wheelchair-accessible tunnels into the fairgrounds. 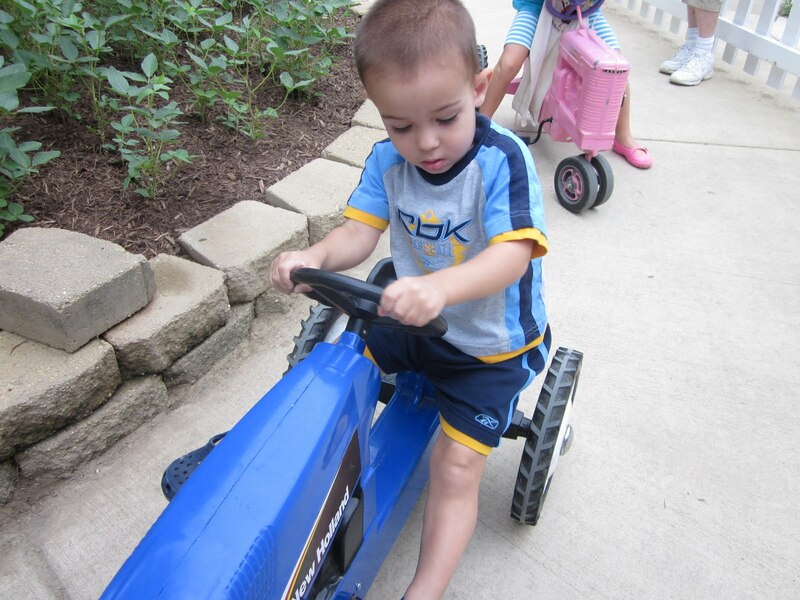 This will make your stroller transporation in and out of the fair infinitely easier. They are marked clearly on the map. Another lesson learned too late. 7.) Cold water is your friend. I packed a few cold bottles in my purse and they were a lifesaver. I saw a few families using bottles they froze in advance. Great idea. I'm not sure if this is frowned-upon by fair staff, but no one said a word to us. It saves you money and time if you already have some of life's most important necessities on hand. The Pathway to Water Quality Exhibit also has cold water if you find yourself in that area. 8.) Use hand sanitizer. Getting to touch and pet the farm animals is a real treat for young kids, but it's important that you also keep them safe. Not to mention the fact than any hands-on exhibit or ride has probably been touched by many of the 900,000+ that attend the fair each year. There are many hand sanitizing stations throughout the fairgrounds, or bring a travel-sized container of your own. 9.) Snacks. A hungry toddler is an angry toddler. I packed some portable snacks for him to munch on as we walked between exhibits and activities and it really kept him happy (and in his stroller!) It was nice not to have to make frequent stops for unhealthy and expensive treats from the many vendors. Save that hassle for meal time. 10.) Have a Midway strategy. If you don't want your kids to ride the carnival rides, or don't want to shell out the money, then just try not to walk by the Midway. I don't mind indulging the arrow in a few rides, so we didn't avoid it altogether, but we easily could have. This obviously doesn't work as your kids get older, so enjoy this phase while it lasts! If you do want to enjoy the Midway, then I recommend taking a quick walk around before buying tickets. I set clear expectations with the arrow that he could only ride a few things and he seemed to understand. He chose a few rides, although he still threw a bit of a fit when we left. Regardless, it saved us some tears, for sure. 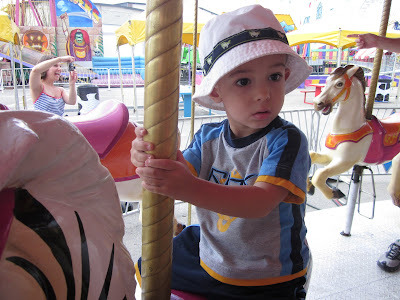 It was also good to walk around because I realized there were only about 3 or 4 rides appropriate for his age and size, so I only bought a few tickets. We also visited the Midway just as it was opening. Not only was there an early-bird discount, but no lines! While I'm a veteran Indiana State Fair attendee, I'm still a newbie when it comes to visiting as a mom of young kids. A special thanks to Barb at Quick Like a Bunny for throwing in a few tips of her own! I'll be blogging more about the Indiana State Fair later this week, both here and at Visit Indiana's Indiana Insider. If you want to keep track of all the fun at the Indiana State Fair, I encourage you to follow the Fair's social media accounts. This post is a part of Top 10 Tuesday at Oh Amanda! The mom's group I'm a part of here in Columbus organized a tour of the Lifeline helicopter at our local hospital. 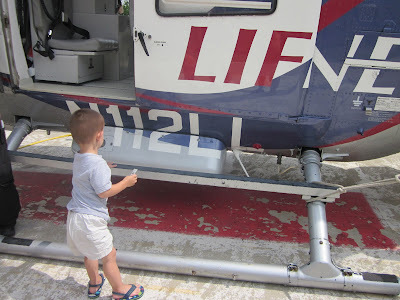 I knew the arrow would LOVE to get up close to one of his favorite things: 'copters (as he calls them). I think it's pretty clear from the photos that I was right. And he loved it so much he didn't think any of the other kids should get to sit in it. Later that afternoon, while he was calmly eating a snack at home, he told me he thought he'd get to ride in the helicopter, that it would "go up high in the sky." So there may have been some confusion that led to this meltdown. 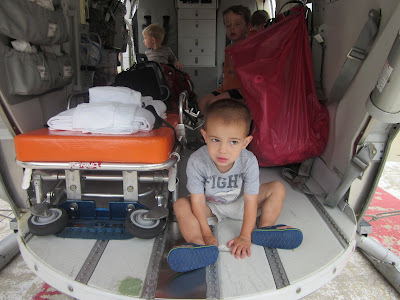 Apparently I need to be a little more clear with him the next time I tell him we're going to see a helicopter. I have no desire to ride in one of these. (And certainly not the kind used for medical purposes.) For starters, I'm pretty prone to motion sickness. And I once took a very scary, white-knuckle ride on a prop plane during a blizzard which has turned me away from small planes forever. So I'll take a mainstream commercial flight to get to my destinations in a heart beat. But today I'm dreaming that someday the arrow will get to go on a helicopter ride. Maybe someplace beautiful, where he can spot volcanoes in Hawaii or glide above glaciers in Alaska. Or take in some breathtaking views of the New York City skyline. Wherever he chooses, I hope that helicopter finally gets off the ground for him. For now, we're working on that whole "sharing" thing. A few months ago I started subscribing to Midwest Living magazine. I love scouring the internet for travel ideas, recipes and such, but I still enjoy kicking it old school with a good magazine from time to time. Makes afternoons keeping an eye on the arrow in our baby pool or walks on the treadmill a lot more interesting. I've been pleasantly surprised at how many ideas I get from Midwest Living--new dishes to try, reviews of various destinations, off-the-beaten path restaurants, etc., all typically within a few hours drive from my house. This probably won't be the last time I credit the magazine with the inspiration for a post. I read with particularly interest in last month's issue the many uses for sweet corn. It's a staple of Indiana summers--we've received many ears in our CSA box already, not to mention the truckloads of the stuff at our farmer's market. I know I run the risk of having my Hoosier status revoked (and my in-laws may disown me if they read this), but I'm not a huge fan of corn on the cob. I think we parted ways sometime around the four years I was in braces and I never really returned to its buttery embrace. So I loved getting some ideas on other ways to incorporate this great, seasonal produce into our meals. 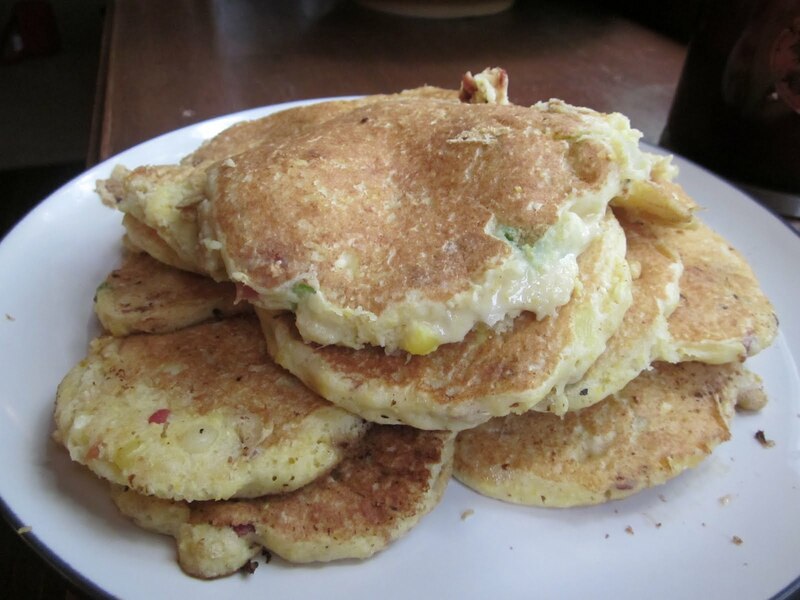 Cornmeal Griddle Cakes with Sauteed Corn caught my eye because it comes in the form of a pancake, so the arrow will actually consider eating it. Always a plus when I can save myself some effort and just cook one thing for all of us. Plus it called for bacon. (Need I say more?) 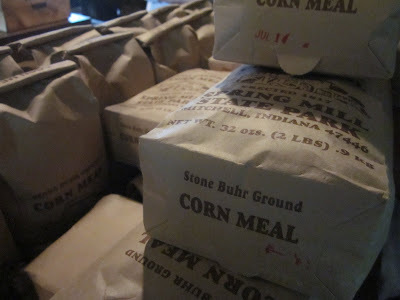 When I realized I could purchase some freshly ground cornmeal during our tour of the Grist Mill at Spring Mill State Park, I knew I was in a position to elevate this dish to a truly locally-grown delight. Our family really enjoyed this dish. I served it with leftover tacos from the night before. (I never know what to make as a side dish on taco night. Turns out these tasty little cakes are perfect!) And don't be fooled by the recipe, which says that you'll get about 12 griddle cakes. 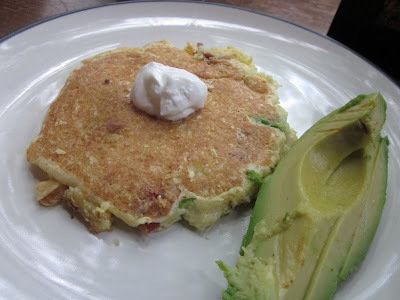 I don't know how big the cakes should be, but I had a stack several inches high by the time I was done cooking all the batter. Our freezer is now happily stocked with several piles of these guys, and I already can't wait to thaw them out this fall when we're craving a taste of Indiana summer and memories from our day at Spring Mill State Park. ﻿This post is a part of Wanderfood Wednesday at Wanderlust & Lipstick.